Let's have some honesty around the Winston factor in this election. 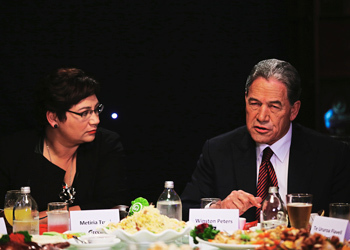 Metiria Turei has received a good amount of criticism for calling out New Zealand First for racist rhetoric during a Q&A interview and at the Green Party campaign launch in Nelson. Some commentators and politicians are claiming it isn't political, or diplomatic, to criticise a potential coalition partner. At the same time there is a growing demand for honest politics and when Metiria stated that the Greens could work with New Zealand First if it allowed progressive change (but it wouldn't be the Party's preferred scenario) this was a truthful representation for voters to be mindful of. It seems that the Greens can't win either way. I wish there was a little more honest analysis of New Zealand First's policies and the Party's relationship with the Greens. Winston Peters is described as a celebrity politician and possibly the only one left in this campaign since our celebrity Prime Minister resigned. His current polling in the preferred Prime Minister stakes is 11 percent, the second highest after Bill English, because of his strong branding and recognition in the political arena. To his credit Winston has been in parliament for 11 terms and 33 years, he only missed out in re-election in 2008 and is probably too old (at 72 years) to be called the "Comeback Kid". New Zealand First is Winston's party, he alone drives the campaigns and asks the majority of the questions in the house. Once he retires it is unlikely that the Party will survive, even with Shane Jones on board. Winston is the consummate populist politician and can be compared with the ambulance chasing lawyers in the US. He is constantly on the lookout for issues or constituencies that are ripe for the political picking. At the same time it has to be admitted that some of what he has achieved throughout his long career have produced positive results. He has entrenched his support from a large number of retirees with his Gold Card and appeals to the sorts of concerns that many elderly have. The majority of Winston's well attended campaign meetings have grey hair. He was also a safe Foreign Minister under the previous Labour Government and he generally sets aside his maverick persona once he has achieved a "secure" position. Winston has a finely-tuned nose for scandal and can effectively spin a story. The "Winebox" Inquiry is the biggest that he is known for and, while no actual fraud was proved, it did result in changes to lax tax law. It was the "Tea Tapes" saga that helped propel New Zealand First back into Parliament in 2011. Winston's claim that he had heard the accidentally taped conversation of John Key and John Banks, and his drip-feeding of its supposed scandalous contents, kept him in the media eye for the last crucial week of the campaign. It turned out that there was nothing of any real consequence in the tape, but the drama around it and Key's heavy handed response created great political theatre and intrigue. At the same time Winston effectively shut out discussions of real policy as it appeared boring in comparison for journalists needing juicy scoops. Since 1996 immigration has been a regular policy platform for Winston and he generally does appeal to the racist fears of many. A good number of New Zealanders feel challenged by cultures other than European and the increasing numbers of Asian immigrants cause them to feel that their familiar way of life may be threatened. In earlier campaigns Winston talked about the "non-traditional" immigration and successfully tapped into those concerns. It isn't actually that difficult to find examples of his racist rhetoric and it is hard to ignore his "two Wongs don't make a white" comment in 2014. This caused the Race Relations Commissioner to accuse Winston of inciting hatred against the Chinese. Metiria is not the first to call him out and it makes the strident denials from New Zealand First a little hollow. New Zealand First's ambulance chasing has revealed two other constituencies that no other party would stoop to engage. Sue Bradford's Section 59 amendment (the "Anti-Smacking Bill") was supported by both Labour and National (113 votes for to 8 against) and surveys and investigations since have revealed that the law change is working well. However, an element of the population still feel that the right of parents to use physical forms of discipline on children (when family violence and the welfare of our children is still a national concern) is being restricted by the act and want it changed. The Conservative Party had supported this view and (as the Party no longer exists), Peters obviously feels that there are potential votes in seeking another referendum. It was sad to see Tracey Martin, a usually strong voice for education and rights of children, having to defend this policy. The other group that New Zealand First want to champion for easy votes is the anti-1080 lobby. This is another cynical attempt to snaffle up another lot of disgruntled, but misinformed, voters for political gain. National, Labour and the Green Party all support the research and science around the use of 1080 and see its use as a last resort attempt to save many of our bird species from certain extinction. MP Richard Prosser is leading the policy to ban the poison to get a large group of New Zealand's hunters onside and is happy to spread obvious misinformation to do this. New Zealand First, despite claiming it would never work with the Greens in earlier elections, actually does collaborate well. The Manufacturing Inquiry was a joint Labour, Green and NZ First initiative and in the debating chamber Winston will often step up in defence of Green MPs if he feels the Speaker has not treated them well. Tracey Martin, especially, has been a strong advocate for our public education system and was worked well with Catherine Delahunty and Metiria on joint areas of concern. The Green Party's Chief of Staff is Deborah Morris-Travers, a past New Zealand First MP. There are clear synergies with New Zealand First and the Greens and the potential for the two parties to work constructively is obvious. Political positioning for this election is already clear. National will be hoping their polling remains at a similar level despite the Barclay revelations (that haven't yet impacted) and that their usual allies will be successful. This is less sure with the Maori Party still struggling and the diminishing significance of the Act Party and United Future. The latter two only really exist because of National's support and Peter Dunne almost lost his Party completely when membership dropped below the 500 threshold. The MOU with Labour and the Greens was a sensible move because, of all the major parties in Parliament, their policies are more closely aligned and voters need to see that there is a workable alternative to National. New Zealand First relies on its populist policies and the charisma of its leader. It needs the flexibility to capture voters that the other parties wouldn't consider and any MOU would restrict that approach. Winston likes to make up policy on the hoof and having a no surprises clause with other parties would remove a major tool from his campaigning tool box. It also works in his favour to keep the door open to both National and the Labour/Greens, it is quite possible that 10% + maybe achieved and Winston revels in the "kingmaker" role. However, after the election and the hunt for voters ends, I can imagine that a Labour/Green coalition with New Zealand First would work fine. It wouldn't be as easy as a straight Labour/Green Government but Winston is very pragmatic, he worked well with Helen Clark and will most likely collaborate well again. This country has some huge environmental and social crises to deal with and I really hope that we don't lose an opportunity to make the very necessary progressive changes because of our very own "Donald Trump" factor. Winston is a far better man than Trump but his methods of campaigning are very similar and it encourages divisiveness. Voters beware!